Today, we will look at an example of an Internet product with Poor Visual Hierarchy, representing a Layout value of +0.0. 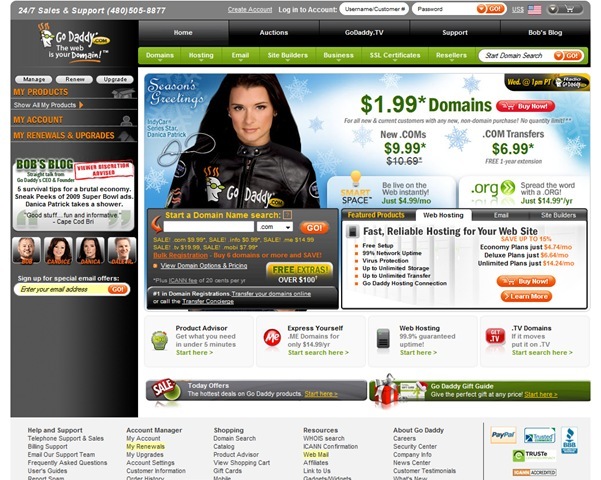 GoDaddy is a website whose primary purpose is to enable people to purchase and setup domain names. Despite a major redesign that this web product has recently undergone, it remains an excellent example of a product Layout with Poor Visual Hierarchy. This assessment is easily accomplished through the evaluation of the homepage, whose Layout and design characteristics are echoed throughout the website. And numerous hot-points on the page, all competing for the initial attention of the visitor’s eyeballs upon arrival, most obviously indicated by the use of the strong oranges and reds on the page. Furthermore, GoDaddy logo and tagline, ‘The Web is Your Domain,’ are dwarfed with respect to the other competing priorities of this page. Even if one can conclude the various competing elements on this page are all equally important and can be concluded as the top of the page’s Visual Hierarchy, their redundancy of purpose and message, as well as no clear relationships between most neighboring elements of the page, and no clear secondary elements (unless one attempts to claim everything else would be secondary) further erodes any potential inherent Visual Hierarchy. Adding to the destruction of the page’s Visual Hierarchy is the clutter of buttons, general content, and marketing on the page. 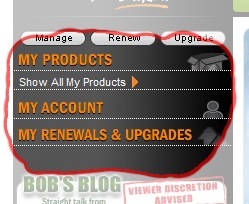 The use of white space and relational placement appear to have no purpose in indicating the importance, or relative importance, of the plethora of options on the page, beyond the lower tier importance attributed to those elements placed in the footer. …all of these options offering a small subset of basic and secondary (or tertiary) services, especially in contrast to many of the other more basic options that can be found on this page for the searching and registering of domain names, in general. 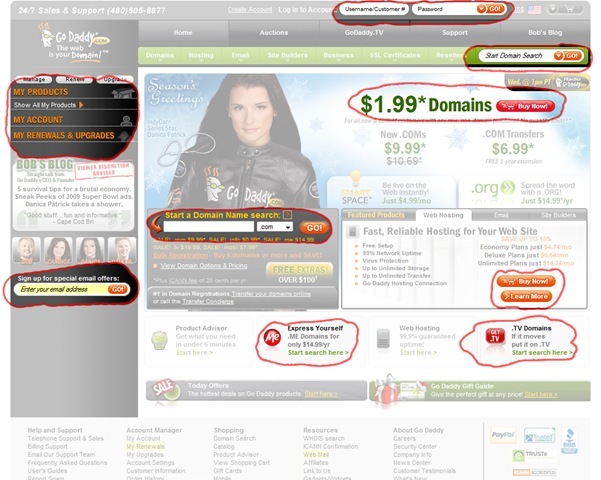 GoDaddy’s homepage, as well as the rest of the web product, provide such a diffused Layout and structured experience as to make identifying either the important or even merely sought after actions an unnecessarily time consuming effort, all contributing to the distinction of being a solid, educational example of a web product with Poor Visual Hierarchy. Really interesting. This is a nice case study. Thank you for this. Try looking for the approval of your transfer request in the Domain Mangler menu. I swear it took like five minutes, just to look for one button that approves my transfer to another host provider. 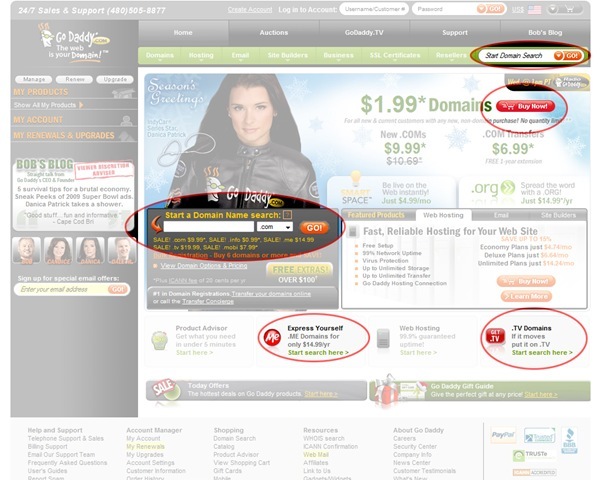 GoDaddy’s website is notorious for jamming ads in the domain management experience. 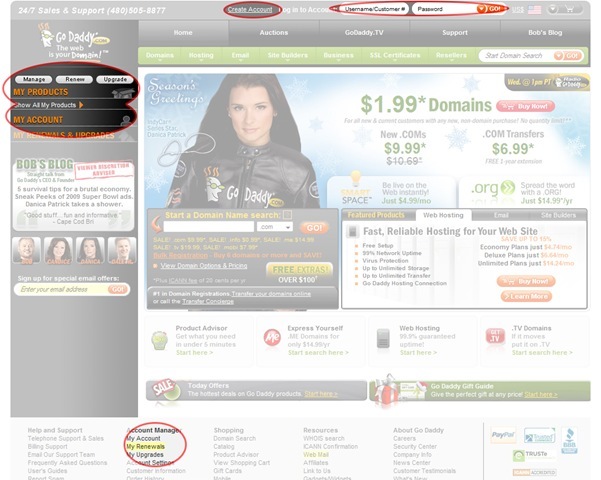 I’m trying an experiment where the only way to get GoDaddy’s attention is to take your shirt off. You should also do a bit on their check out process… It is confusing as hell, and not user friendly at all. They bank off the idea that you will add something you really don’t need. Nice post, Thanks!